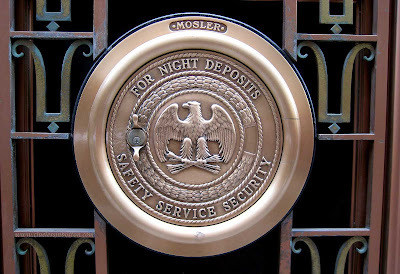 A Mosler night deposit box on a Franklin Street bank. The Mosler Safe Company was at one time the largest safe-making company in the world. Its safes and vaults were renowned for their strength and precision manufacture, several Mosler vaults installed in Hiroshima's Mitsui Bank building prior to WWII survived the nuclear attack, and the company subsequently produced doors for missile silos and even the vault now used to display and store the United States Constitution and Declaration of Independence. Mosler was sold in 1967 to American Standard Inc., a diversified concern, and later to a private concern before going bankrupt in 2001. I wonder how many of these night safe deposit boxes are still in use? Great shot and story about the vault company.